Offers: Some discount schemes. Contact club for information. Clubhouse with changing rooms, bar, restaurant, lounge and pro shop. Golf facilities include a practice area and equipment hire. 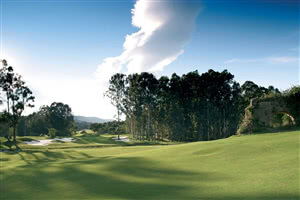 Santana Golf & Country Club is Golf Resort development in the hills behind Fuengirola, Costa del Sol. The course, a Par 72, 18 hole Championship length layout designed by Cabell B. Robinson, is laid out on relatively flat land which was previously an avocado plantation (so walking is relatively easy, unusal for courses in the hills). The fairways are wide and the, well protected, greens large and undulating. Always immaculately maintained the course is scenically pretty and technically tough from the back tees. However, the option of four tee positions means the course can also be enjoyed by less accomplished golfers.